"A breathtaking master class in the rapid evolution of the financial markets in recent decades, the transformation from paper and trusted men in suits to electronics and ruthless (often criminal) competition, and the intense lives of the men and women that drive the most dominant industry of the modern world. The story is told with a dramatic flair, convincing depth, cinematic visualization, and a good measure of healthy humor, taking the reader on a realistic Wall Street rollercoaster of the best kind. Highly Recommended!" The Columbia Review. And with that, the novel is off to a fascinating journey through more than three decades inside what the public calls “Wall Street” yet is in fact a global organism of interconnected financial markets in worldwide locations. The author masterfully uses dramatic tools of fiction to tell a chronology of suspenseful trials and tribulations. The detailed descriptions ring true—perhaps because they have actually happened. The characters are alive, colorful and convincing, the setting is fascinating and meticulous, and the events are literally pulled from news headlines. 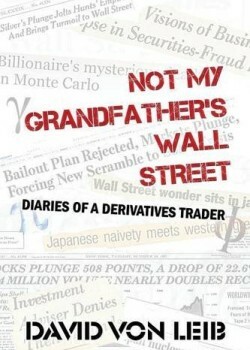 In summary, Not My Grandfather’s Wall Street is a breathtaking master class in the rapid evolution of the financial markets in recent decades, the transformation from paper and trusted men in suits to electronics and ruthless (often criminal) competition, and the intense lives of the men and women that drive the most dominant industry of the modern world. The story is told with a dramatic flair, convincing depth, cinematic visualization, and a good measure of healthy humor, taking the reader on a realistic Wall Street rollercoaster of the best kind. Highly Recommended!